Brand Bodyguards – Must Your Business’s Website Be ADA Compliant? The ADA meets the Web. Businesses are getting hit by lawsuits from plaintiffs’ attorneys claiming their websites don’t comply with the Americans with Disabilities Act (the “ADA”). While the ADA was enacted before the commercial Internet existed, courts interpret the ADA as requiring businesses that are “public accommodations” to have websites usable by the disabled. The ADA doesn’t give an exhaustive list of what businesses are “public accommodations,” but any business that sells goods or services to consumers likely is covered. Businesses that sell exclusively to other businesses probably are exempt. Suing businesses with non-ADA-compliant websites has become popular with plaintiffs’ attorneys. While such lawsuits rarely lead to compensatory damages payments, the ADA allows a successful plaintiff to recover attorneys’ fees in addition to getting an injunction requiring ADA compliance. The plaintiffs’ attorneys are after those fees. If you get hit and settle quickly, you still might pay up to about $20,000 in attorneys’ fees to the other side, plus whatever you spend on website work and on your own attorney. Unfortunately, the federal government has not promulgated regulations specifying what features websites must have to be ADA-complaint. While it’s not the law, courts have cited the Web Content Accessibility Guidelines as the standard to meet. These guidelines are produced by the World Wide Web Consortium (W3.org). The guidelines have levels, from single A (lowest) to triple A (highest). Courts cite the middle, double-A level of disabled-friendly functionality. • Many vision-impaired people use screen readers, so make the website work with popular ones. • Provide text alternatives to PDF documents, because PDF’s are unreadable by screen readers. • Have tags for images. • Provide captioning for videos. • Make it so one can use the website with only a keyboard (no mouse); many disabled people can’t use a mouse. 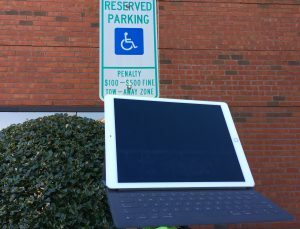 It’s unclear whether a covered business’s mobile app must be ADA compliant if it also has a website with the same functionality. The safe course is to make the mobile app disabled-friendly also. I spoke with the head of a prominent Richmond website development firm. He said his company has gotten a few large clients because they were sued over website ADA non-compliance. His company has gotten much more business from companies looking to proactively become ADA compliant, perhaps while doing a website refresh. He pointed out that doing search-engine optimization and becoming ADA compliant are synergistic tasks. Building your website in a Google-friendly manner will put you a long way toward ADA compliance. Making your website ADA compliant will help a lot with meeting Google’s standards, which helps in your Google ranking. Thus, becoming ADA-compliant might be good for business. He added that making a website ADA compliant will typically add about 15 percent to website-development cost, but that can vary greatly depending upon the nature of the website. He added that you should have your website inspected regularly (probably quarterly) to see if it is still in ADA compliance as it evolves. That will be an additional regular expense. Written on March 19, 2019.